Victoria’s Secret, as all women and possibly even men know, is a premier lingerie brand for women. The brand is entirely owned by L brand and sells a number of other products besides the undergarments. Such products include women’s wear and even top notch beauty products. When you enter Victoria’s Secret store or even happen to browse through their extensive catalogue on the website, everything must look very pleasing and be appealing to the eye. But here is a list of things which employees working for this top American lingerie brand will never tell you. 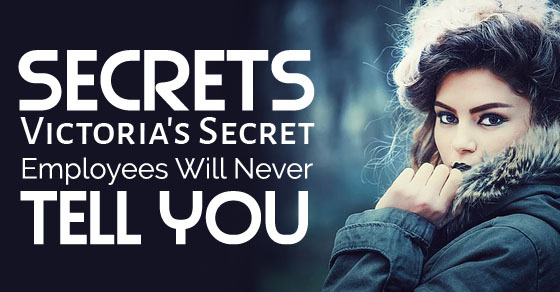 In this article, some secrets victoria’s secret employees will never tell you. A Victoria’s Secret Sale might sound like a dream come true for a number of us, yet there are only a few women who cringe at the thought of a sale and these women are the employees of the brand who have to work extra hard during the sale period. Of course working for a huge brand like this does come with a number of perks, yet when you are forced to deal with unaccommodating and insensitive customers then you might just feel like you have entered a jungle or even a mad house. People should note that employees are not maids or servants, they need to be respected too. The front of the store might look pink and lovely; attracting customers to indulge a little, yet the back store is absolutely chaotic. Trying to manage all the products is never an easy thing to do and when the semiannual sale is over, the employees are as good as dead beat. The employees try to ensure that they manage everything to the best of their ability but due to the incredible bulk which they have to take control of within the confines of a very small space indeed, things do get a little out of hand. When you are in Victoria’s Secret store and shudder at the thought of having an employee sneak up behind you asking you to get an angel card. At such a time it is important to realize that this is merely part of the job description of the employee. He or she gets no personal pleasure in asking you to sign up. So even if you have no interest in getting the card ensure that you act in a polite manner because this is a job unpleasant for both parties. Don’t give answers like ‘if I wanted one I would have approached you myself’ or ‘do not bother me now I’m running on a time frame’. Initially, employees might not be able to do this very effectively, yet over time as they look at some woman they will be able to tell immediately whether or not the person is wearing the right kind of under garment or not. It is because of this kind of perception that they are instantly able to both help as well as assist customers which enter the store. Women should realize that each one of them have a distinct body shape and it is only when they use the right kind of clothes and under garments that they will be able to accentuate their curves or hide their imperfections in a graceful manner. Disagreeing with employees is a wrong move. Most employees have no qualms about helping the customers get into or garment or help them while they do it in the changing room. But that certainly does not imply that you go ahead and reveal to them too much of your body which they are in no way interested in seeing. Along with this there are some customers who are so shy of daring to bare and seek council. You should realize that you are just one of the many customers who the employees have to deal with, they have seen it ALL and they are never going to laugh or poke fun at you as that is entirely unethical, they appreciate all body types and finally doing that is sure to get them fired! Many customers think it is necessary to go on and narrate to the employees of the store why they are purchasing the product. Employees are very well mannered and are bound to listen to your story and even nod politely to show that they are happy for you, this certainly does not imply that you go into the grotesque details about how it is going to make your husband or boyfriend very happy. A little friendly chatter is always good, but no one is interested in the dirty details no matter what the occasion is or how you intend on going about celebrating the occasion and making it memorable. It is sad but true that there are many people who return products in a terrible condition without having any shame or inhibitions. At such a time employees are bound to take back the products rather than having to say anything to these people who are obviously very thick skinned indeed. Returning things like perfumes, garments or make up items is alright and acceptable, but there are many people who try on the undergarments and swimwear, possibly even use them and then come back to return them. Many a time employees catch stains, marks and smudges in the most unsightly of places. What not many Victoria’s Secret employees will tell you is that they own a number of products themselves. Being around so many pretty, colorful and well designed items is bound to cause them to do a little impulsive buying for themselves as well. One obvious perk they have is that they do get a considerable discount on all the products and that makes everything so much more irresistible to them. Which woman would not like to shop where she works and that is why the employees of this brand love what they do and make for some very happy employees indeed. What you might not know and never will hear is that all the employees end up smelling exactly the same, this is because they all make use of the same products which they happen to purchase from the store itself. In the outside world being able to make use of a Victoria’s Secret product is a novel experience in itself but at the store you are just one of the many people who make use of these products. This being said you can rest assured that all the employees smell great and even look great throughout the day and evening. Employees are all like one family in the company and the employees have an uncanny feeling of kinship with all the models whether they have gotten to know them personally or not. It is something which they say that they cannot exactly explain in words yet it is something which brings them immense joy and pride when they happen to look at a successful Victoria’s secret fashion show, advertisement or even a bill board. They feel glad that it is because of their efforts, in whatever little way, the company has been able to maintain its high standards and deliver excellent products to all those who enter the store. The store employees will never tell you, but they notice every customer very intricately and men as well as women have a very different way of shopping indeed. The women are instantly attracted to bright colors as well as discounted items, where as men will buy whatever they think will look good on their wives, or even better buy anything which they lay their hands on first as they are very embarrassed to go looking all around the store, lest they be deemed as creeps or perverts by the women who are usually all around, browsing for the best bargain. Employees silently take keynote of the fact that to most women age is just merely a number and they often purchase lingerie which might not be very age appropriate but is sure to make them feel young and beautiful. Such women who are not embarrassed to embrace their feminine side are indeed a source of inspiration to one and all. So no matter what your body size is you should never shy away from making yourself feel beautiful. If you are confident in your skin, then nothing will be able to pull you down and no one will dare pass any comments about you. The mannequins in the store are very life like indeed and employees often watch people bang into the mannequins and thinking them to be human beings. This is something which is very amusing indeed, yet at the same time, when a number of these mannequins are kept in a dark corner of the store room then the sight looks nothing short of a scene from a horror movie. This is especially because all the mannequins are headless. Most employees across the globe hate and detest victoria secret staff uniform, yet this is not true for those who are working at Victoria’s secret as they simply adore that black uniform which is smart, sassy as well as classy. Their uniforms are made to perfection and ensure that the employees blend in with the surrounding and crowd rather than having the employees stand out from the rest of the crowd. In addition to working for a company which pays well and gives you a good discount on their products, one of the best parts of the job, which you will never hear an employee talking about is the dance parties which they have after hours. Usually women do not make for good friends, yet this is a misconception because those working as employees are very self assured and they never indulge in petty activity like back talking or spreading rumors about the other. All employees are like family. Working towards, keeping the company banner flying high. Finally, if you open a draw and leave it like that or pick up a product and not put it back in its original spot, rest assured that employees have seen this and they are just too nice to point it out to you because they are trained to act courteously. After going through this list carefully you must realize that many of these things have come as rather a shock to you considering how to put together the store, the websites and even the various fashion shows are. A sign of a good business is that the employees work tirelessly behind the scenes so as to ensure that the business flourishes without the customers ever getting a hint of the chaos or the problems happening behind the scenes. It is therefore not without reason that women across the globe crave for Victoria’s Secret lingerie, swimwear, footwear, cosmetic items, perfumes and so on. A business not managed well will never gain such immense popularity.